Have you seen the green desert? Are We Living in the Anthropocene? The Senate stimulus package, which would have given a much needed boost to green technology through production tax credits, failed to pass a Senate filibuster vote last night, with one no-show. Who was the no show? Sens. Obama and Hillary -- exhasuted from their extremely tight primary race -- managed to return to the Senate for this high-profile vote last night... wait, who was the no-show during the critical energy bill vote last year? 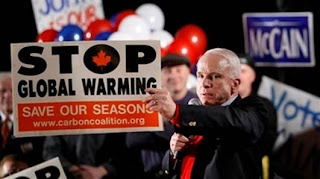 Oh right, that would be the "green" Republican presidential hopeful, Senator John McCain. We must hold McCain accountable for his pathetic voting record, or lack thereof, as the candidates continue to march down the campaign trail. His absence and statement that he would have voted no, had he even showed, coupled with the undeserved credit he has received for being "greener" than his oil-, coal- and uranium-stained Republican counterparts, is unfortunate. McCain's green title died last night when he failed to participate in another critical vote to stimulate the growth of our green economy. Regardless of which way Senator McCain would have voted, his spokeswoman claims he would have voted no and he simply said it "it's very hard; obviously, I've missed a lot of votes. There's no doubt about it," Senator McCain is just that: a SENATOR and his job is to vote on behalf of his constituents. His vote does matter, did matter, and if he wants to win the Whitehouse in '08 he must convince the American people that their votes matter. By choosing not to fulfill his duty it is clear he will be a deadbeat on the issues we care so much about. Let the takeaway message from this post be the following: John McCain has received undeserved praise for his empty stance on environmental issues and he cannot be trusted to fulfill campaign promises. If he were elected, it is becoming clear we would see only a trail of unbroken promises, a tally of missed votes and opportunities for four more years; we simply cannot afford it. Another fact: In the 110th Congress, out of 450 votes, McCain missed 56.7% of all votes. The only one who missed more was a senator who had a brain hemmorhage. It does seem that Senator McCain is truly out to lunch, and not fit to be our President. *- Senate Majority Leader Harry Reid (NV) switched his vote to 'no' at the last moment, a parliamentary move that allows him to bring the measure up for revote, making the final vote 58-41... but 59-40 is a much better number for the headline don't you think? When the government is handing out cash, all thoughts of spending discipline seem to go to the dogs. Short term thinking makes humans more like other animals. I didn't realize that some part of the green was slated for the greens too! What we really need is a stimulus package like this one for education. Let the evasions roll!